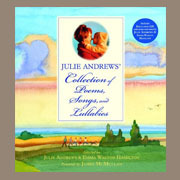 A wonderful mix of Julie Andrews’ and daughter Emma Walton Hamilton’s most cherished poems, songs, and lullabies abound in this rich and diverse poetry collection. Brought to life with James McMullan’s stunning watercolor paintings, this volume features nearly 150 treasured works, including beloved classics and modern favorites from Robert Frost, Emily Dickinson, Jack Prelutsky, Shel Silverstein, Rodgers & Hammerstein, and more – twenty-one of which are theatrically and playfully read aloud by Andrews and Hamilton on the accompanying CD. Andrews introduces each of the nine themed sections with intimate stories and family memories, offering readers a glimpse into her world and her personal connection to many of the selections. There are even a number of special poems written by the authors themselves as well as contributions from close family members. This deluxe anthology is bound to inspire an early love of poetry and song and become a classic for families to grow with and treasure throughout the years. By Julie Andrews Edwards and Emma Walton Hamilton.